The first thing to talk about with Diablo is the requirement for a constant internet connection, it is an entirely unnecessary requirement in my humble opinion. While I haven’t experienced any of the connection error messages that many people came upon at launch and after a recent patch, I have suffered lag when playing on my own. That’s right, I have experienced lag in a singleplayer game mode, that somehow doesn’t sound quite right does it? Further to this I have been timed out of my game, again my singleplayer game, for leaving it on the pause menu for too long. This resulted in me losing all my progress on the map or dungeon I was currently on, throwing me back to the most recent checkpoint which could have been twenty minutes ago. Having to go back through the dungeon or map from the start for being timed out is infuriating. 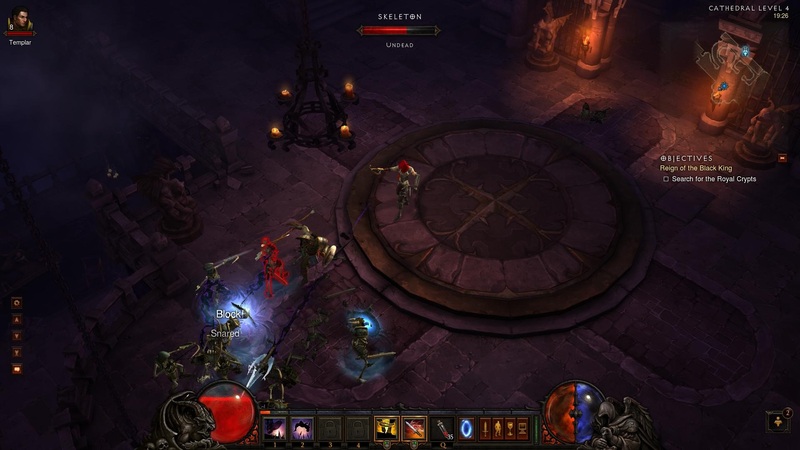 While Blizzard may say that Diablo is a multiplayer game at heart, I prefer to play on my own, at a pace that suits me. As such, I don’t see the need for being connected at all times, and when it impacts on my enjoyment of a game, I am going to mention it. I wish Blizzard had included an offline mode, whereby you can’t take your offline character into multiplayer games and can’t use the Auction House, it would have solved a lot of the technical issues with the game. Personally, I don’t see the requirement for the Auction Houses, let alone the newly opened real money Auctions. Why anyone would feel the need to spend real money on items they can find in the game is beyond me, but the auctions are there is players want to use them, though in my view, they break the joy of the game which is to find your own loot as you play. I don’t want to buy a new weapon for early-game character which is more powerful than anything I would find until the mid-game levels. While they aren’t my cup of tea, I am sure some people will find the auctions useful to give them a helping hand in getting the best equipment. The multiplayer aspect works well enough, if you have friends playing in the same Act you are, you can join in with them to share the fun of the game. A few mouse clicks and you can play together, it is quite seemless, but I recommend you have voice comms with those you are playing with so you can easily communicate when you want to explore the area you are in a bit more. I know that some people see multiplayer as being the true face of Diablo games, but it didn’t really do much for me. Getting onto the game itself, it is fun for the most part, but to be brutally honest, it isn’t a masterpiece and I still think I would rather play Torchlight again rather than go back to Diablo a few months down the line. When I play Diablo I find myself thinking at times that it is a chore of mad mouse clicks and button mashing and little more wrapped up in a story of Good vs Evil or Heaven vs Hell. It is a cynical way to look at the game, but that is how I have felt at times. At heart though, Diablo is still thoroughly enjoyable, while it is a clickfest, you have to be on your toes for how you approach different foes. It is no use relying on your primary ability, you really have to make use of your secondary skills, both passive and active, to make smooth progress through the swarms of hell that you will find yourself stuck in the middle of. It takes a while to unlock all four secondary ability slots, but the balancing of the game is such that you won’t need all those skills until you unlock them. Even once you have unlocked all the skills, you will find that you have to change your setup along the way, especially as you come up to bosses towards the end of the game. After failing to defeat the boss at the end of Act III several times, I dug through my skills and changed things around to use some that I had never touched before. Now I don’t know how I went through the game without using them. Some people might think there is a lack of depth to character development when levelling up as you don’t assign points to traditional stats such as Strength and Dexterity, but the depth of the skill system and the runes you can apply to your skills more than makes up for this. Beyond the skills there is a ton of loot to customise your character with, you can’t move two feet without coming across something new to pick up, and frequent visits back to town to sell your goods are essential. Some items are socketable with various gems which confer nice little bonuses to that piece of equipment and there is a merchant who can combine gems of the same type to provide a bigger stat boost. You can also visit a blacksmith who will make custom weapons and armour, though you have to spend a lot of money training him up to get to the good stuff. Even then, you will likely find that the majority of the random loot you find is better than his wares, and indeed it will be better than what is on offer from the various merchants. 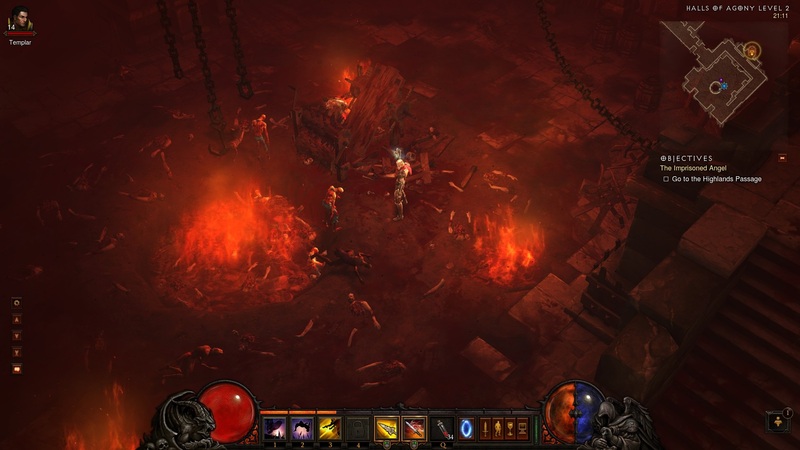 The opening Act of the game takes place in Tristram, the town at the heart of the Diablo series, it is wonderfully created and provides a welcome introduction to the game. For someone relatively new to the series (I played a tiny little bit of Diablo I many years ago) it was a good way to start the game and get an idea for what was happening in the world of Sanctuary. It was an enjoyable Act, full of undead and with a great atmosphere. I won’t spoil Act III or IV, but I will freely admit that I came close to giving up with Act II, the story took a lull, the enemies were horrendously annoying to fight and the levels themselves were for the most part very poor compared to what came before, and the brilliance that comes after. 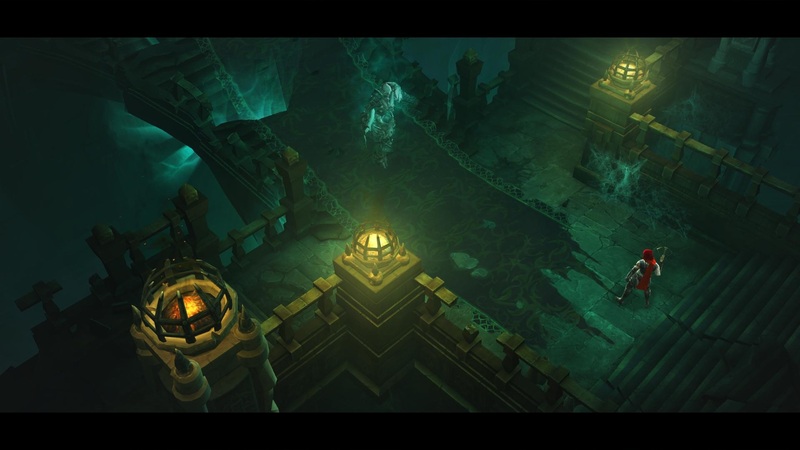 If you are going to be put off Diablo III at any point, it will be during Act II, but if you can push on, you will be rewarded with some spectacular moments in Act III. This is where the games’ art style really shines, with incidental background details flourishing and the story picking up in pace and drama. By this point you will also either love or hate your companion of which there are three on offer. One is a melee basher, another a specialist from range and the final companion is skilled in magic. You can equip them and choose their abilities as they level up, but they do have a habit of repeating comments over and over during the game. I learned to ignore these moments, but they might annoy some. Despite this, the back-stories are quite interesting if you take the time to listen to them. Diablo III isn’t as good as I thought it might be, it has some delightful moments, but it does drag at some points of the story and the always online requirement is, frankly, pathetic. However, it is still a great example of how addictive clicking furiously on demons can be, but it fails to convince me that it deserves the hallowed Red Mist rating. For more information on our scoring policy, head here.